We are thrilled to announce that Healthy Artists has been officially invited to blog for Michael Moore! Check out our first post for Michael’s site entitled, “‘Healthy Artists’ Film Series Captures the Heart of Single-Payer”. 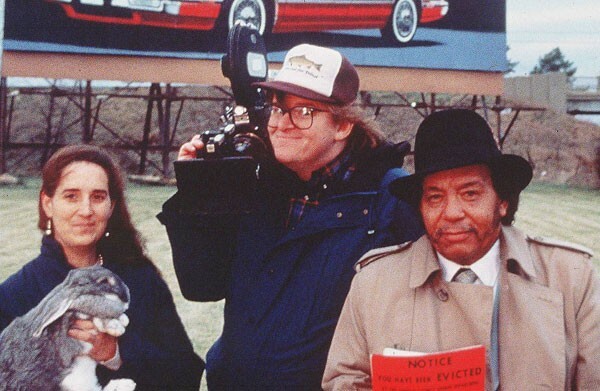 Michael Moore is the pioneering filmmaker and activist behind documentary classics such as Roger & Me (1989, pictured above), and newer films such as Sicko (2007), a film which helped to expose the injustices of America’s for-profit health care system, while spotlighting the more ethical universal health care systems that exist around the world. We are honored to be in association with Moore as we continue to channel storytelling, filmmaking, and art, towards the pursuit of single-payer health care in the US. We had an art show.